The third edition of THE INSIDER’S TELL-ALL HANDBOOK ON WEIGHT TRAINING TECHNIQUE incorporates Chapter 12 of the first edition of BUILD MUSCLE LOSE FAT LOOK GREAT, along with additional exercises and other information. To benefit from bodybuilding workouts, you must avoid injuries, and train consistently and effectively. But if you don’t use correct exercise technique, you’ll get injured frequently, and you’ll be unable to train consistently and effectively using the best exercises. With 300 pages and 363 photographs, this manual is thorough. 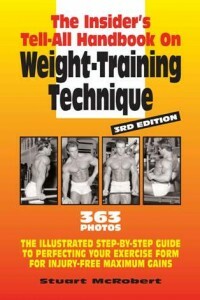 Follow its guidance and become your own expert personal trainer on weight training technique. This guide is for bodybuilders of all ages and levels of training experience. Barring freak accidents, training injuries have nothing to do with bad luck. They have everything to do with ignorance, following bad advice, and inattentiveness. Done properly, bodybuilding is safe. The building of strength itself helps protect against injury. Most injuries are a result of an imposed force exceeding the structural strength of the involved bodypart. If structural strength is increased, resistance to injury will be increased, too. But to build this protective strength, you must train safely, without injuries. So you must use correct exercise technique.